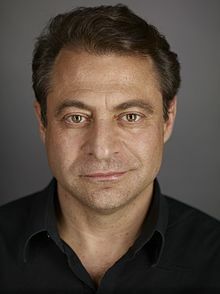 Peter H. Diamandis (/ˌdiːəˈmændɪs/; born May 20, 1961) is a Greek American engineer, physician, and entrepreneur best known for being founder and chairman of the X Prize Foundation, cofounder and executive chairman of Singularity University and coauthor of The New York Times bestsellers Abundance: The Future Is Better Than You Think and BOLD: How to Go Big, Create Wealth, and Impact the World. He is former CEO and cofounder of the Zero Gravity Corporation, cofounder and vice chairman of Space Adventures Ltd., founder and chairman of the Rocket Racing League, cofounder of the International Space University, cofounder of Planetary Resources, cofounder of Celularity, founder of Students for the Exploration and Development of Space, vice chairman and cofounder of Human Longevity, Inc.
Diamandis was born in The Bronx, New York. His parents, both Greek immigrants, were in the medical business. His father was a physician. From a very early age, Diamandis expressed a keen interest in space exploration. At age 8, he began giving lectures on space to his family and friends. At age 12, Diamandis won first place in the Estes Rocket Design Competition for building a launch system able to simultaneously launch three rockets. After graduating from Great Neck North High School in 1979, Diamandis attended Hamilton College for his first year, then transferred to the Massachusetts Institute of Technology to study biology and physics. During his second year at MIT in 1980, Diamandis cofounded Students for the Exploration and Development of Space. Diamandis graduated from MIT in 1983 with a B.S. in molecular genetics. He then entered Harvard Medical School to pursue his M.D. During his second year of medical school, he cofounded the Space Generation Foundation to promote projects and programs that would help the Space Generation—all those born since the flight of Sputnik—get off the planet. During his last year of medical school in 1989, Diamandis was acting as managing director of the International Space University and CEO of International Micro Space, a microsatellite launch company. In 1986, Diamandis put his medical degree on hold and returned to MIT to pursue a master's degree in aeronautics and astronautics, conducting research at NASA Johnson Space Center, the MIT Man Vehicle Laboratory and MIT's Whitehead Biomedical Institute. After completing his M.S. at MIT, Diamandis returned to Harvard completing his M.D. In 1987, during his third year of medical school, Diamandis cofounded International Space University with Todd Hawley, Walter Anderson and Robert Richards. Diamandis served as the managing director and chief operating officer of the university until 1989. Today, ISU offers a Space Studies program and two accredited Master of Space Studies degrees. It has grown into a $30 million university campus headquartered in Strasbourg, France. Diamandis cofounded Microsat Launch Systems, later renamed International MicroSpace Inc., in 1989 during his fourth year of medical school and served as the company's CEO. IMI designed a small launcher called Orbital Express for taking 100-kg payloads to low-Earth orbit, collaborating with Bristol Aerospace for the manufacture. The company won a $100 million SDIO contract for one launch plus nine options and was sold to CTA Inc of Rockville, MD in 1993 for $250,000. Diamandis joined CTA for one year as VP of Commercial Space Programs post-acquisition. In 1991, Diamandis founded Constellation Communications, Inc., one of five low-Earth orbit satellite constellations for voice telephony. The company was funded to deploy an equatorial ring of 10 satellites to provide communications primarily to Brazil and Indonesia. Constellation was sold to E-Systems and Orbital; Diamandis remained director until 1993. In 1994, Diamandis founded the X PRIZE Foundation after the failure of International MicroSpace, Inc and reading Charles Lindbergh's The Spirit of St. Louis. He serves as chairman and CEO of the foundation. X PRIZE was created to fund and operate a $10 million incentive competition intended to inspire a new generation of private passenger-carrying spaceships. The prize was announced on May 18, 1996 in St. Louis, MO without any purse money or any teams. The prize was ultimately funded through an insurance policy underwritten by the Anousheh and Hamid Ansari Family and renamed the Ansari X PRIZE in their honor. The $10 million competition attracted 26 teams from seven countries as teams and was won on October 4, 2004 by Mojave Aerospace Ventures, a team run by famed aviation designer Burt Rutan and funded by Microsoft cofounder Paul Allen. The winning vehicle, SpaceShipOne, was piloted to space twice within two weeks to win the competition. The first flight was made on September 29, 2004, piloted by Mike Melvill, and the winning, second flight was made on October 4, 2004, by pilot Brian Binnie. SpaceShipOne was the world's first non-government piloted spacecraft and is now hanging in the National Air and Space Museum adjacent to the Spirit of St. Louis aircraft. In January 2005, the X PRIZE Foundation Board of Trustees expanded the focus of the X PRIZE to address four different group areas: Exploration (oceans and space), Life Sciences, Energy and Environment, and Education and Global Development. Since inception, the foundation has launched the $10M Ansari X PRIZE (awarded), the $10M Automotive X Prize (awarded), the $10M Archon X Prize (in progress), the $30M Google Lunar X PRIZE (in progress), the $10M Qualcomm Tricorder X PRIZE, the $2M Lunar Lander Challenge (awarded), the $1.4M Wendy Schmidt Oil Cleanup X Challenge (awarded), and the Wendy Schmidt Ocean Health X PRIZE. In May 2012, the Robin Hood Foundation announced its plans to partner with the X PRIZE Foundation for several New York-based challenges targeted at eradicating poverty. The X PRIZE Foundation has a staff of approximately 50 individuals and is headquartered in Culver City, California. It boasts an all-star board of trustees, including Larry Page, Elon Musk, James Cameron, Dean Kamen, Ratan Tata, Ray Kurzweil, Jim Gianopulos, Naveen Jain, Arianna Huffington, Will Wright and Craig Venter. In 1994, Diamandis cofounded ZERO-G with Byron Lichtenberg and Ray Cronise. The space entertainment company offers weightless experiences aboard its FAA-certified Boeing 727 aircraft and provides NASA with parabolic flight services for research, education and training. The company has flown over 10,000 customers. In 2007, physicist Stephen Hawking experienced eight rounds of weightlessness on a ZERO-G flight. Diamandis said that the successful outcome of that flight was proof that "everyone can participate in this type of weightless experience." He would recount the experience of taking Dr. Hawking into the upper atmosphere at TED2008. Between 1995 and 1999, Diamandis was the president of Angel Technologies Corporation, a commercial communications company that develops wireless broadband communications networks. Founded in 1998, Space Adventures is a space tourism company that has flown eight private customer missions to the International Space Station since 2001. Diamandis is the cofounder and vice chairman of Space Adventures. Between 2000 and 2001, Diamandis was the CEO of BlastOff! Corporation, which proposed to fly a private rover mission to land on the Moon as a mix of entertainment, Internet and space. The company lost funding and ceased business in 2001. In 2005, Diamandis cofounded the Rocket Racing League. Developed as a cross between IndyCar racing and rockets, it envisioned enabling the public to enjoy speed, rockets and competitive spirits. Diamandis was the chairman of RRL until it ceased business. In 2008, alongside American author, inventor and futurist Ray Kurzweil, Diamandis cofounded Singularity University. Today Diamandis serves as the university's cofounder and executive chairman. SU is an interdisciplinary university with the mission to assemble, educate and inspire a cadre of leaders who strive to understand and facilitate the development of exponentially advancing technologies to address humanity's grand challenges. With the support of a broad range of leaders in academia, business and government, SU hopes to stimulate groundbreaking, disruptive thinking and solutions aimed at solving some of the planet's most pressing challenges. SU is based on the NASA Ames campus in Silicon Valley and supported by a number of corporate founders and partners including Google, Autodesk, Cisco, Nokia, Kauffman Foundation and ePlanet Ventures. The university runs a 10-week Graduate Studies Program, a seven-day Executive Program and a five-day Exponential Medicine conference. In April 2012, Diamandis cofounded Planetary Resources Inc., an organization dedicated to the identification, remote sensing and prospecting of near-Earth approaching asteroids, with Eric Anderson. Billionaire investors include Google's Eric E. Schmidt and Larry Page, as well as Ross Perot, Jr. and Charles Simonyi. Advisors include filmmaker and explorer James Cameron and several renowned scientists. Following financial troubles caused by "delayed investment", it was announced in October 31, 2018, that the company's human assets were purchased by the blockchain software technology company ConsenSys, Inc. In March 2014, Diamandis cofounded Human Longevity Inc. (HLI), a genomics and cell therapy-based diagnostic and therapeutic company focused on extending the healthy human lifespan, with Craig Venter and Robert Hariri. He also has supported SENS Research Foundation, a nonprofit organization that seeks to treat and cure the diseases of aging by repairing the underlying damage caused by aging. After internal disputes about management Venter left Human Longevity to return to the Venter Institute and was sued for 'stealing trade secrets'. The case has been dismissed. In February 2018, Diamandis launched Celularity with Bob Hariri. It is a biotechnology company productizing allogeneic cells and tissues derived from the postpartum placenta. These materials have the ability to augment our immunity and longevity by amplifying the body’s ability to fight disease, heal, and regenerate itself. It is the first company to own and deploy the full value chain from sourcing placental stem cells to patient treatment. In 2012, alongside Steven Kotler, Diamandis coauthored Abundance: The Future Is Better Than You Think. The nonfiction work discusses the potential for exponential technology and three other emerging market forces to significantly raise global standards of living within the next 25 years. Abundance was well-received; it was #2 on The New York Times Best Seller list and remained on the list for nine weeks. It was #1 on the non-fiction bestseller lists of Amazon and Barnes and Noble. At the 2014 Clinton Global Initiative, former US president Bill Clinton recommended Abundance to readers as an antidote to negative news. In 2015, again alongside of Steven Kotler, Diamandis coauthored another New York Times best selling book, Bold: How to Go Big, Create Wealth, and Impact the World. This nonfiction book provides analysis and instruction for entrepreneurs interested in learning about exponential technologies, moon-shot thinking and crowdsourcing. Served as CEO of Desktop.tv, a spin-off company from BlastOff! designed to provide a global peer-to-peer television network for broadcasting unique content to the desktop. Served as chairman of Starport.com, an Internet channel for space exploration for kids of all ages. The site represents over 20 astronauts and features space heroes, missions and simulations. Sold to Space.com. cofounded and served as director of the Space Generation Foundation, a nonprofit organization established in 1985 to create, in all people born since the advent of the Space Age on October 4, 1957, a sense of identity—an awareness that they are born as members of a space-faring race. The foundation supports numerous educational and research projects. Founded SpaceFair in 1983. SpaceFair is a national space conference that was hosted by MIT in 1983, 1985 and 1987. Was a key subject in the 2007 documentary film, Orphans of Apollo. Is the New York Times bestselling author of Abundance – The Future Is Better Than You Think. Abundance was #1 on Amazon and #2 on New York Times. Is a member of the Xconomists, an ad hoc team of editorial advisors for the tech news and media company, Xconomy. 1983 MIT John Asinari Award for outstanding Undergrad Life Sciences research. 1984 MIT William L. Stewart, Jr Award for the founding of SEDS. 1986–1987 Biomedical Research Support Grant supported by the NIH. 1986 Space Industrialization Fellowship presented by the Space Foundation. 1988 Aviation Week & Space Tech. Laurel in recognition of founding ISU. 1993 Space Frontiers Foundation "Pioneers Award," presented for cumulative work done in the commercialization and development of the space field. 1995 Konstantine E. Tsiolkovsky Award presented by the Russian government for the creation of ISU (along with Hawley and Richards). 1996 "Special Merit" award presented by the National Space Society for outstanding work done by space pioneers under the age of 40. ^ Krol, Aaron (March 4, 2014). "J. Craig Venter's Latest Venture Has Ambitions Across Human Lifespan". BioIT World. Archived from the original on August 3, 2014. Retrieved March 5, 2014. ^ Miller, John J. (July – August 2005). "Extraordinary Feats of an X-Man". Philanthropy Magazine. Archived from the original on March 14, 2013. Retrieved August 17, 2012. ^ a b Caulfield, Brian (February 13, 2012). "Peter Diamandis: Rocket Man". Forbes. Archived from the original on July 16, 2012. Retrieved August 2, 2012. ^ a b Ruhling, Nancy (2012). "Eyes on the Prize" (PDF). Lifestyles Magazine (Pre-Spring 2012). Archived from the original (PDF) on February 22, 2015. Retrieved August 3, 2012. ^ a b Greenwald, Ted (July 17, 2012). "Peter Diamandis launched the X Prize, now he plans to mine asteroids". Wired. Archived from the original on October 29, 2013. Retrieved August 2, 2012. ^ Lightman, Alex (June 19, 2009). "From X PRIZE to Singularity University". H Plus Magazine. Archived from the original on June 17, 2012. Retrieved August 17, 2012. ^ "Peter Diamandis LinkedIn". Retrieved July 30, 2017. ^ "About Peter Diamandis". Peter H. Diamandis LLC. Retrieved July 30, 2017. ^ Daniel, Patrick (June 25, 2015). "A Conversation With Peter Diamandis". HuffPost. Archived from the original on January 24, 2016. Retrieved July 30, 2017. ^ a b c "Peter Diamandis: Executive Profile & Biography". Bloomberg BusinessWeek. Archived from the original on July 28, 2013. Retrieved August 3, 2012. ^ Brekke, Dan (January 2000). "Who Needs NASA?". Wired. Archived from the original on August 20, 2012. Retrieved August 17, 2012. ^ a b Greenwald, Ted (June 22, 2012). "X Prize Founder Peter Diamandis Has His Eyes on the Future". Wired. Archived from the original on August 17, 2012. Retrieved August 17, 2012. ^ "Space Studies Program". International Space University. Archived from the original on August 4, 2012. Retrieved August 3, 2012. ^ "Overview of MSc Programs". International Space University. Archived from the original on February 8, 2014. Retrieved August 3, 2012. ^ Pike, John. "ORBEX ["ORBital EXpress"]". GlobalSecurity.org. Archived from the original on March 13, 2012. Retrieved August 3, 2012. ^ "Directors". Angel Technologies Corporation. Archived from the original on May 16, 2012. Retrieved August 17, 2012. ^ Kozlowski, Lori (April 27, 2012). "Lessons in Radical Philanthropy". Forbes. Archived from the original on April 30, 2012. Retrieved August 17, 2012. ^ Diamandis, Peter. "Prepared Statement by Peter Diamandis at a House Science Committee Hearing on NASA Aerospace Prizes". SpaceRef. Retrieved August 17, 2012. ^ Pitta, Julie (June 13, 2012). "Visionary Peter Diamandis' Five Best Reasons the Future is Better Than You Think". Forbes. Archived from the original on June 13, 2012. Retrieved August 2, 2012. ^ "Prize Development". X PRIZE Foundation. Archived from the original on August 5, 2012. Retrieved August 3, 2012. ^ Anders, George (March 11, 2012). "X Prize Founder Aims to Fix Education; Anyone Have Some Ideas?". Forbes. Archived from the original on August 26, 2012. Retrieved August 17, 2012. ^ Vallance, Chris (January 12, 2012). "Star Trek-style 'tricorder' invention offered $10m prize". BBC News. Archived from the original on October 15, 2012. Retrieved August 17, 2012. ^ "Incentivized Competition Heritage". X PRIZE Foundation. Archived from the original on August 15, 2012. Retrieved August 3, 2012. ^ Kozlowski, Lori (April 23, 2012). "Attention Heroes: Who Will Save The World's Oceans?". Forbes. Archived from the original on January 23, 2013. Retrieved August 17, 2012. ^ Upbin, Bruce (May 15, 2012). "Robin Hood And X Prize Join Forces To Fight Poverty in NYC". Forbes. Archived from the original on January 23, 2013. Retrieved August 17, 2012. ^ "Board of Trustees". X PRIZE Foundation. Archived from the original on August 5, 2012. Retrieved August 3, 2012. ^ "Space Adventures Announces the Acquisition of Zero Gravity Corporation". Space Adventures. Retrieved August 17, 2012. ^ Boyle, Alan. "Hawking Goes Zero-G: 'Space, Here I Come'". MSNBC. Archived from the original on May 12, 2012. Retrieved August 17, 2012. ^ Diamandis, Peter. "Peter Diamandis on Stephen Hawking in Zero G". TED2008. Archived from the original on August 9, 2012. Retrieved August 17, 2012. ^ Platt, Charles (June 2006). "Ethernet at 60,000 Feet". Wired. Archived from the original on January 1, 2007. Retrieved August 17, 2012. ^ Vergano, Dan (May 27, 2012). "An 'Abundance' of targets for asteroid miners". USA Today. Archived from the original on August 17, 2012. Retrieved August 17, 2012. ^ Diamandis, Peter (December 7, 2009). "Commercial Spaceflight for the Rest of Us – Congratulations to Virgin Galactic". HuffPost. Archived from the original on February 27, 2013. Retrieved August 17, 2012. ^ Diamandis, Peter. "Google Lunar X PRIZE – The BlastOff Story". X PRIZE Foundation. Archived from the original on April 6, 2014. Retrieved August 17, 2012. ^ "X-Prize man launches rocket race". BBC News. October 4, 2005. Archived from the original on October 24, 2012. Retrieved August 17, 2012. ^ Boyle, Alan (October 3, 2005). "'Rocket racing league' gets its start". MSNBC. Archived from the original on September 16, 2012. Retrieved August 17, 2012. ^ Grover, Ronald (September 23, 2007). "Gentlemen, Start Your Rockets". Bloomberg Businessweek Magazine. Archived from the original on November 2, 2012. Retrieved August 17, 2012. ^ "Board of Trustees". Singularity University. Archived from the original on July 23, 2012. Retrieved August 3, 2012. ^ Takahashi, Dean (August 28, 2011). "Peter Diamandis sounds the alarm on embracing exponential technologies". VentureBeat. Archived from the original on September 11, 2012. Retrieved August 17, 2012. ^ "Graduate Studies Program". Singularity University. Archived from the original on July 6, 2012. Retrieved August 3, 2012. ^ "Executive Program". Singularity University. Archived from the original on July 7, 2012. Retrieved August 3, 2012. ^ "Exponential Medicine". Singularity University. Archived from the original on June 1, 2015. Retrieved May 4, 2015. ^ Klotz, Irene (April 24, 2012). "Tech billionaires bankroll gold rush to mine asteroids". Reuters. Archived from the original on July 5, 2012. Retrieved August 2, 2012. ^ Mann, Adam (April 23, 2012). "Tech Billionaires Plan Audacious Mission to Mine Asteroids". Wired. Archived from the original on August 20, 2012. Retrieved August 17, 2012. ^ "Team". Planetary Resources. Archived from the original on August 20, 2012. Retrieved August 3, 2012. ^ Kowalski, Heather. "Human Longevity Inc. (HLI) Launched to Promote Healthy Aging Using Advances in Genomics and Stem Cell Therapies". Archived from the original on March 6, 2014. Retrieved March 6, 2014. ^ Steenhuysen, Julie (March 4, 2014). "For his next act, genome wiz Craig Venter takes on aging". Reuters. Archived from the original on March 6, 2014. Retrieved March 6, 2014. ^ Diamandis, Peter; Kotler, Steven (February 21, 2012). Abundance: The Future Is Better Than You Think. Free Press. ISBN 978-1451614213. ^ Gertner, Jon (March 30, 2012). "Plenty to Go Around: 'Abundance,' by Peter H. Diamandis and Steven Kotler". The New York Times. Archived from the original on November 5, 2012. Retrieved August 17, 2012. ^ "Best Sellers: Hardcover Nonfiction". The New York Times. March 11, 2012. Archived from the original on May 5, 2012. Retrieved August 17, 2012. ^ "Dr. Peter H. Diamandis". X PRIZE Foundation. Archived from the original on August 25, 2012. Retrieved August 17, 2012. ^ Diamandis, Peter (February 22, 2012). "New book by Peter Diamandis and Steven Kotler, Abundance, debuts #1 on Amazon and Barnes & Noble". Kurzweil. Archived from the original on February 26, 2012. Retrieved August 17, 2012. ^ Diamandis, Peter; Kotler, Steven (February 2015). Bold: How To Go Big, Create Wealth and Impact the World. Simon & Schuster. ISBN 9781476709567. ^ Board of Trustees Archived October 5, 2013, at the Wayback Machine. XPRIZE (November 8, 2011). Retrieved 2013-09-23. ^ Planetary Resources – The Asteroid Mining Company – Team Archived May 1, 2012, at the Wayback Machine. Planetaryresources.com. Retrieved 2013-09-23. ^ Our Team | Singularity University Archived August 5, 2013, at the Wayback Machine. Singularityu.org. Retrieved 2013-09-23. ^ Greenwald, Ted. "X Prize Founder Peter Diamandis Has His Eyes on the Future". Archived from the original on September 21, 2012. ^ Peter Diamandis Archived July 19, 2013, at the Wayback Machine. Xconomy. Retrieved 2013-09-23. ^ Introducing ISU – International Space University Archived August 9, 2013, at the Wayback Machine. Isunet.edu (April 12, 1995). Retrieved 2013-09-23. ^ Astronaut Advisors & Board Members Archived August 7, 2013, at the Wayback Machine. Space Adventures. Retrieved 2013-09-23. ^ Intelius – Peter Diamandis Archived April 6, 2014, at the Wayback Machine. Corp.intelius.com. Retrieved 2013-09-23. ^ "Archived copy". Archived from the original on May 22, 2014. Retrieved May 22, 2014. CS1 maint: Archived copy as title (link). Cogswell Polytechnical College. Retrieved 2014-05-21. ^ "Hyperloop". hyperlooptech.com. Archived from the original on April 24, 2015. Retrieved April 24, 2015. ^ "SEDS Advisors". Archived from the original on June 6, 2017. Retrieved March 31, 2017. ^ "Exceptional Creativity in Science & Technology Participants". John Templeton Foundation. Retrieved May 21, 2014. ^ "Welcome Dr. Diamandis". Penn State Advanced Vehicle Team. Archived from the original on May 22, 2014. Retrieved May 21, 2014. ^ "High Ambitions: Peter Diamandis Keeps His Eyes on the Prize". Airport Journals. Archived from the original on May 22, 2014. Retrieved May 21, 2014. ^ Webber, Gwen. "Orphans of Apollo". Blueprint Magazine. Archived from the original on November 10, 2011. Retrieved January 30, 2013. ^ "About Our Mission, Team, and Editorial Ethics". Xconomy. Retrieved January 2, 2018. ^ a b c "Leadership Lunches – Fall 2008". Archived from the original on May 25, 2014. Retrieved May 22, 2014. ^ "Award Recipients Archive". Retrieved May 22, 2014. ^ "NSS Space Pioneer Awards". Archived from the original on June 29, 2014. Retrieved May 22, 2014. ^ "2003 World Technology Award Winners and Finalists - The World Technology Network". wtn.net. Archived from the original on March 16, 2015. ^ Welf, Kelley. "Lindbergh Foundation to Present 2006 Lindbergh Awards". Archived from the original on May 17, 2014. Retrieved May 16, 2014. ^ "2006 Rave Awards". Archived from the original on May 17, 2014. Retrieved May 16, 2014. ^ Heinlein Prize Archived June 22, 2013, at the Wayback Machine. The Heinlein Prize. Retrieved 2013-09-23. ^ Carreau, Mark (May 25, 2006). "Leader in space tourism wins prize". Houston Chronicle. Archived from the original on July 15, 2007. ^ "Arthur C. Clarke Awards". Archived from the original on May 17, 2014. Retrieved May 16, 2014. ^ "And the winners were..." Technology Quarterly. Archived from the original on May 19, 2014. Retrieved May 16, 2014.